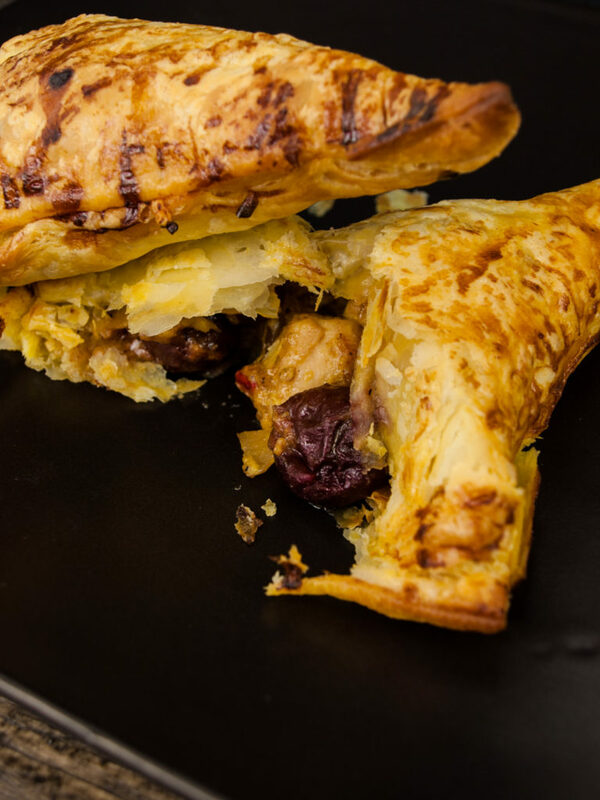 A delicious exotic flavor combination with juicy cherries and zingy ginger chicken in a crunchy puff pastry parcel! Chicken and ginger are one of my favorite flavor combinations of all times. Add some juicy cherries as well as curry mixture and you end up with an incredible sweet-savory dish. If you go even one step further and wrap everything in a crunchy and flaky puff pastry jacket you get delicious hand-held samosas that are perfect sharing dish for a picnic, potluck or buffet! This dish is inspired by one of my neighbor’s favorite dishes. A few days after I moved to my current apartment in Amsterdam I ran into a guy in the elevator. Ever since then my neighbor Justin and myself have been hanging out regularly. Turns out we share a lot of similar interests – the main ones being delicious food, beers and playing video-games! One of Justin’s signature dishes that I came to love over the years is his incredible cherry, ginger and curry chicken! He creates this delicious treat in the form a full-sized quiche. I took the liberty to break the recipe down into individual-sized portions while changing the mix of the spices slightly. When packing this tasty exotic filling into puff pastry squares you get portable pockets that you can easily share with family and friends. It’s just the perfect crowd pleaser! One of the ingredients in Justin’s dish was completely new to me – “stem ginger”! Stem ginger are small little balls of young ginger root. They have the same zingy fresh ginger taste without being as fibrous and woody as their bigger raw counterparts. Because they come in a jar in sweet syrup their taste is also mellower and blends together ever better with other ingredients, especially with the cherries in this dish. If you can’t find stem ginger normal ginger will do as well, but you might want to add a little extra sweetness with a tablespoon of honey. Cheers to you Justin – thank you for this awesome inspiration and see you around again soon! And to you my trusty readers I can only say: Trust your friends in Amsterdam and dare to combine juicy cherries with delicious gingery chicken! It may sound like a slightly odd combination at first, but you for sure won’t be disappointed! Create a juicy filling and bake it into parcel perfection! Fetch your puff pastry from the freezer and let defrost on the kitchen counter. Drain the cherries in a colander and preheat your oven to 210°c (fan works best for an even brown crust). Cut chicken into 1x1cm cubes and finely dice the garlic and stem ginger. Put a skillet on very high heat. Add the butter as well as chicken and brown the pieces from all sides. Takes about 4 minutes. Season generously with salt and pepper. Add the garlic, ginger, curry and onion powder, sambal, crème fraiche and starch. Stir to combine. Reduce the heat to medium and simmer for 3 minutes. Add the cherries, stir to combine once more and remove from heat. Place a big spoonful of filling into the middle of each puff pastry sheet. Sprinkle with cheese and fold over diagonally so you end up with triangles. Take the back of a fork and press it into the edge of the parcel to seal. Use a sharp knife and add a few small slits into the pastry to let the steam escape. Scramble the egg and brush the egg-wash on top of the pastry. Bake samosas in the oven for about 15-20 minutes until golden brown. Take a big bite out of your delicious samosas! They are tasty hot as well as cold! Let us know what you think of these tasty crunchy parcels! Have you ever had chicken with cherries before? Do you love the soft and mellow taste of stem ginger just as much as we do? Place your comments below and help us to make this recipe even better! Next Post Winners of the free beer give-away!